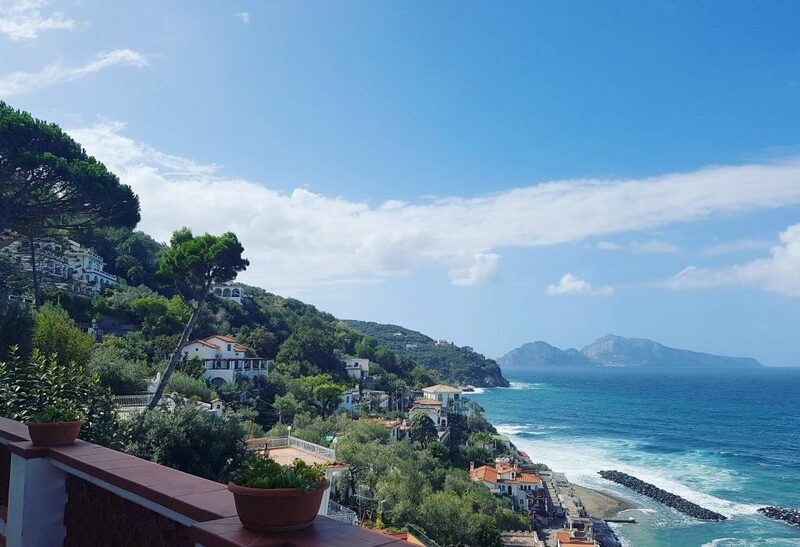 For my first visit to Italy I want to go big, so I booked a 7 bedroom villa near Sorrento for me, my husband and my family. The plan was to rock up, start chilling and plan a couple of excursions to Pompeii and Capri. 3 members of the party don’t like to fly, so half of us came by train from the UK, while the other half flew. The fliers, which included R and I, set off from Stansted on Monday 11 September and we met up with the train people, who had set off the day before, in Massa Lubrense town square during a crazy storm that lasted most of the day and into the evening. The villa itself was set just outside of Massa L. proper, down a private road, about 100m from the sea. The villa itself had 2 levels, 3 balconies and 2 hot tubs. It was amazing! The view was incredible and the villa itself was clean and spacious. Not the absolute height of luxury, but we immediately solved that by filling it full of prosecco. On Tuesday we chilled around the villa, then went into Massa for dinner. The walk along the seafront was incredible, with huge waves crashing over our heads and soaking us all before we got to the restaurant. In hindsight, on the day after a big storm, we probably should have taken the (literally) high road. On Thursday R and I went to Pompeii while the rest stayed back and chilled at the villa. Pompeii was awesome, but crazy huge. We saw most of the important stuff but missed the brothel. More annoyingly, we also missed Mark William’s short and impromptu theatrical performance in the small amphitheatre, which the others had seen the day before. Friday was boat trip day. I hired a private boat to take us on a tour around Capri, with a stop off on the island for a few hours after lunchtime. Capri was a mix of crazy busy streets and quiet, ultra high-end shopping districts, so R and I decided to just wander around, have some ice cream and stop at a restaurant for a drink. We all agreed we’d much rather have stayed on the boat, which was amazing, and done some more sea swimming, which was incredible. We all jumped off the front of the boat except for my mother, who passed, and my little brother, who decided to dive instead 😉 R snorkelled for a bit and saw some swordfish, and we all yelled at him for nearly getting run over by another boat. Half of our party left today, which is Saturday, as they had to get the train back to the UK. Just the fliers are left, so we’re going to spend the day chilling at the villa and maybe go for a swim down at the small beach nearby. The weather is still amazingly hot and sunny, we’re all a mix of burned and tan, my hair has gone orange (not sure how or why!) and we’re all going to be sorry to leave. However, R is missing Errol like crazy so I know he’s going to be pleased to go back. Errol, on the other hand, has bonded with his sitter and, according to the pictures she’s sent us, seems to be having the time of his life. Best meal: La Primavera in Massa L.